Phew...I finally finished. 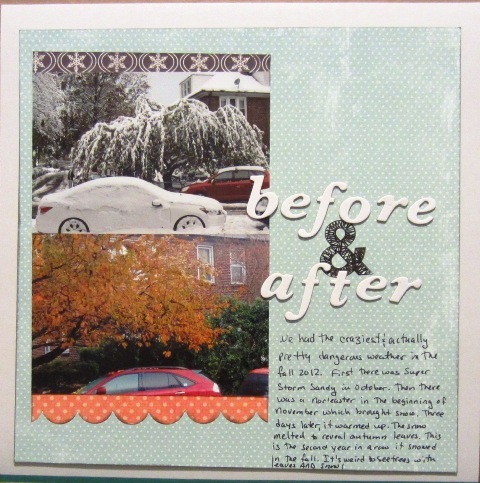 I completed 20 layouts using a stack of last chance papers and scraps. I am happy it's over and while it was tedious to flip through the same papers over and over, I am kind of glad I did it. These were papers that survived a couple of purges because I was sure I would use them. I did use a lot but I am very ready to give them away now. As the end of the challenge drew near, I started to save the "good pictures" for when I could use new papers. I can now donate the left over papers with no guilt. This challenge taught me to be more prudent about buying papers and it's motivating me to use more from my stash before buying new supplies. I had to set aside and amazing assortment of new supplies to complete this challenge and I just can not wait to dig in. I hope to feel that way with all my future purchases instead of getting used to seeing it pile up. 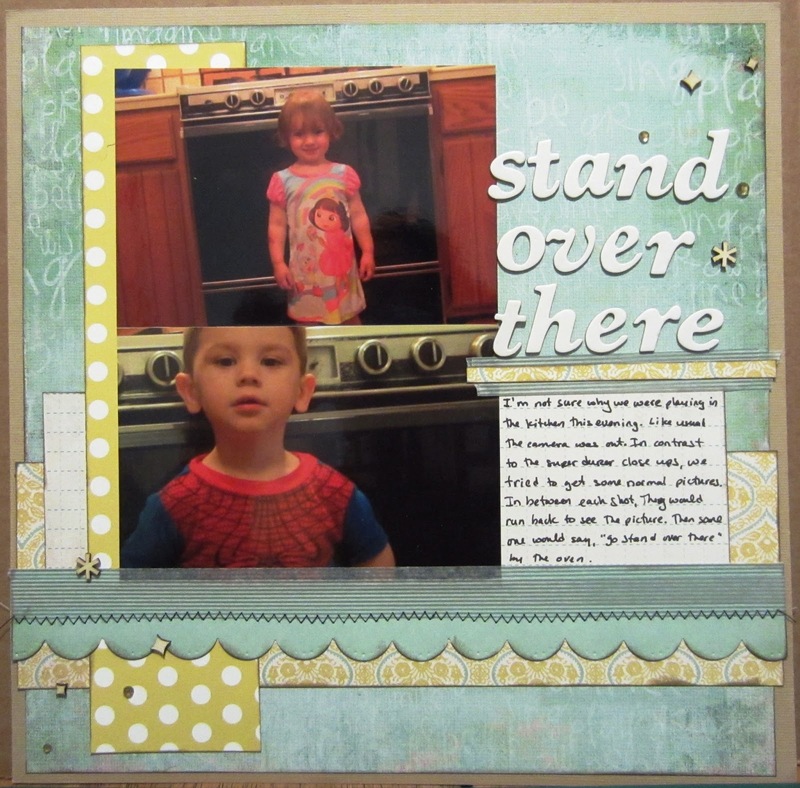 Here are all the layouts from this challenge which I started March 23rd. I did it!! 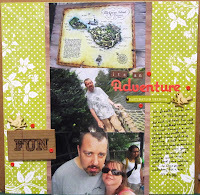 This is the final layout from my Use it or Lose it Challenge. It's a simple layout but I like it's simplicity. These are some pictures of rides in Disney from a different angle, from Tom Sawyer's Island to be exact. 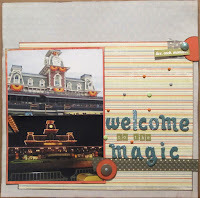 I used a cream bazzill cardstockfor a base and added some My Mind's Eye papers. I sprinked some black Mr. Huey's Color Mist in opposing corners. I stapled some some paper twine (how's that for a blast from the past??!). 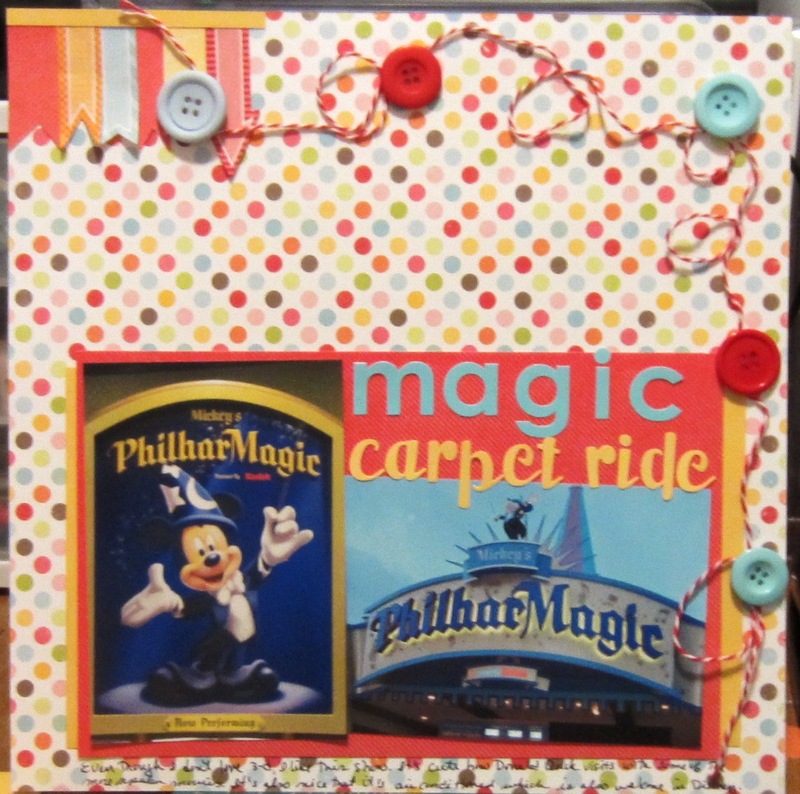 The title is Jillibean Soup chipboard letters and Making Memories tiny letters. Now the challenge is behind me. The leftovers will go to my friend who works at a psych hospital. She collected a ton of supplies back in January but said they can always use more. I am so glad to get some things out of the house and that it will go to people who will enjoy it. I am in the final stretch of my layout challenge and really really struggled with this one. I don't like it at all. I don't really care about telling this story. I am just ready to be out of this challenge. 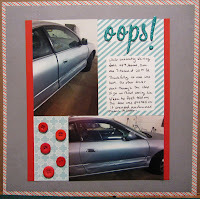 Use it or Lose it #19 - oops! The papers are My Mind's Eye and Echo Park papers. The journal block is from Echo Park as well. The letters of American Crafts and the buttons are from my stash. 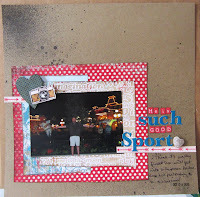 This is My Mind's Eye and Studio Calico papers, Stampin' Up bling, Freckled Fawn wood veneers and some washi tape. 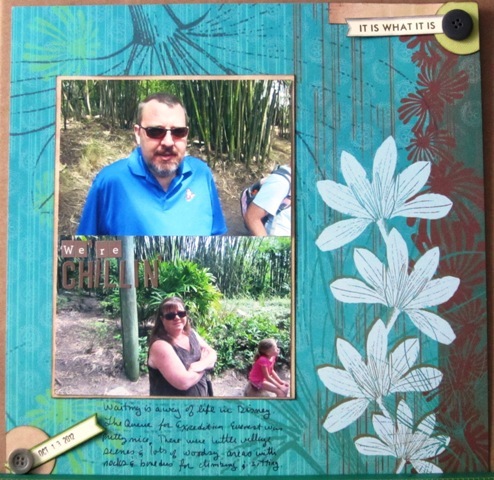 I border punched the lighter blue paper and added some stitching. The sewing machine really gave me a hard time, I think I need to get better thread. Last year, I went to Florida with my sister and her kids to visit our mother. Most of our family lives in the area so we hosted a get together at the hotel so we could see everyone and so they could all meet Ben and Rebecca. There are a host of pictures from the afternoon. It was a really fun day and it was so terrific to see everyone at once. Ok, surprise surprise, I used My Mind's eye papers here. 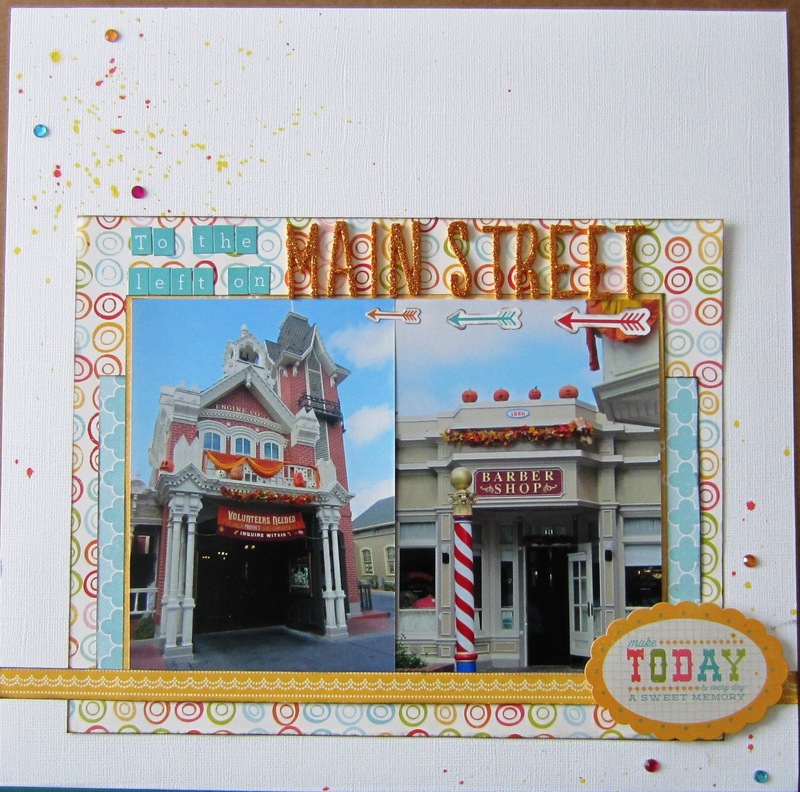 There is also Making Memories (pink polka dot) and bazzill cardstock. 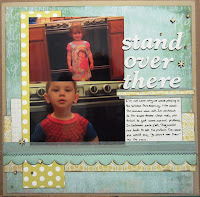 I also used bakers twine from the Twinery, Stampin' Up bling, American Crafts Thickers and a frame from my stash. 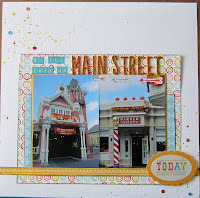 This layout is based on a sketch from Scrapbook Generations which I followed almost completely. 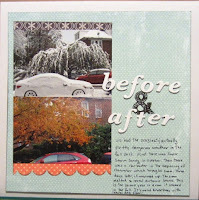 I hand cut the larger clouds and used a Fiskars punch for the smaller one. The butterfly is from a sizzix die. I cut two, sewed it down the middle and used some foam dots in between the layers for some dimension. No, not date night. Don's not much of a night owl so we tend to do things in the afternoon and then go for dinner instead of the other way around. On this date, we saw Moneyball which was pretty good. It involved sports, rooting for the underdog, math and Brad Pitt all in one. Eddie's Sweet Shop is right across the street. They are one of the few original homemade ice cream parlors that are left in the area. There are little flecks of vanilla in the ice cream. So good! I used a lot of different papers here. 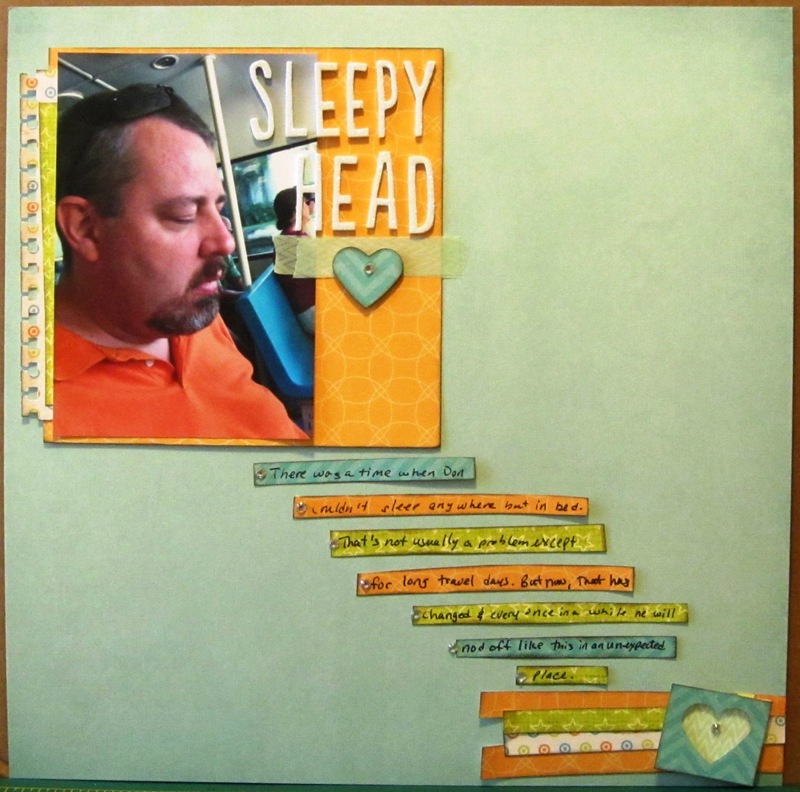 The base is Die Cuts With a View, then My Mind's Eye they rest are from my scraps box and include more My Mind's Eye, Studio Calico, Jillibean Soup and October Afternoon. I outlined them all with my trusty sharpie. 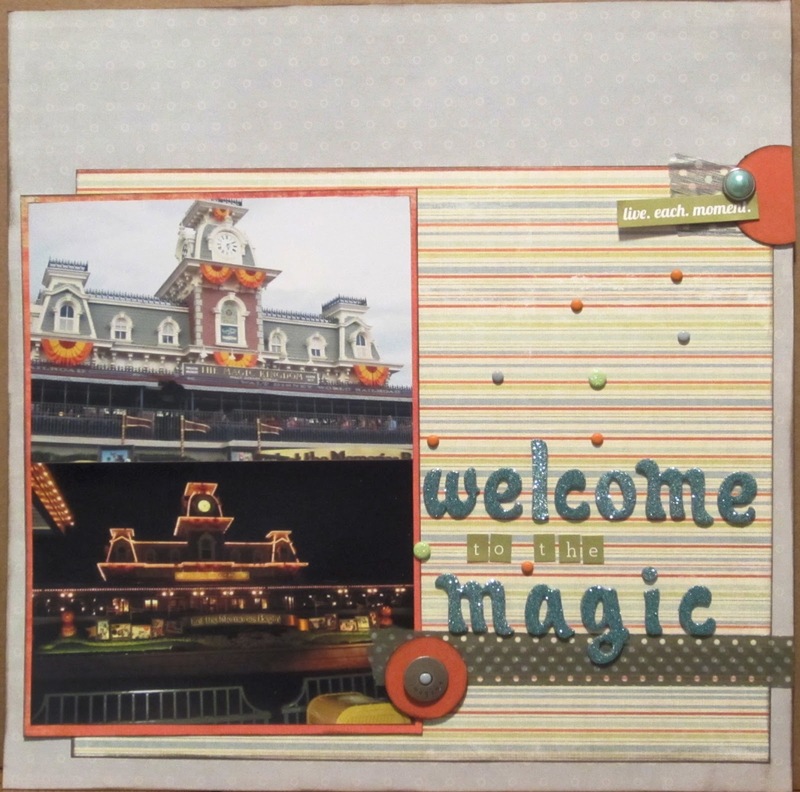 I used American Craft Thickers, Mr. Huey's Color Mists, a word wood veneer by Freckled Fawn plus some buttons and bling from my stash. These are just some pictures from the Jungle Cruise ride line at Disney World. It's one of our favorites - it's silly and relaxing. 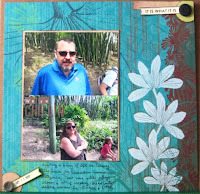 The journaling is about how the tour guides used to be able to ad lib their spiel. That must have been funny if you had a guide with a great sense of humor. I guess this became a problem at some point so now there's a Disney approved script they need to follow but according to one guide, there are several options for each "joke point" so the ride is different each time. The passengers play a part too - if there's someone a little outgoing on the boat, they might interact with the guide which also makes the ride unique. There is My Mind's Eye and Die Cuts with a View patterned paper and Bazzill cardstock. The title is anchored on some grey polka dot washi tape, using Jillibean Soup chipboard letters which I outlined with my trusty sharpie pen along with Simple Stories letter stickers. I punched out some circles and stars and added some Oriental Trading pearls to the corners. I can't say that I am pleased with this layout. At first, I liked the wood grain with the blue paper. It needed something and I thought it the red border would help but I think it looks too heavy. I choked on embellishing and went with stars but I think they look western although looking at it on my screen it actually feels Christmas-y. I don't know if I should pop the whole thing off the blue paper and put it on kraft or something else. Of course that means there's the risk of messing up the whole thing because the blue flowers are glued down to the wood grain. To get out of this challenge, I'll leave it for now and maybe reconsider it in the future. What do you do when you really struggle with the final product? As you can probably tell by now, I spend a lot of time with my sister and her kids. We usually grab a bite to eat and do something fun. Some days it's shopping, some it's going to a park or a movie. There's one mall with lots of children stores and a carousel. This day we went to the Grand Luxe Cafe for breakfast. Ben and Rebecca were playing games on their leap pads or on an iPhone. Here my sister is showing Rebecca how to play a game and then you see her playing it. I am sure in another couple of years they will know more about electronics than me. All the patterned papers are from My Mind's Eye cut into strips and sewn onto white Bazzill Cardstock. I trimmed the excess threads and dotted some glossy accents on those points and taped down the end points on the back. I don't know if it's necessary but I didn't want to find out the thread will come undone the hard way. 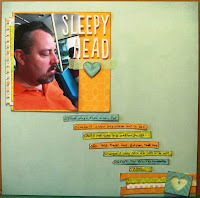 The title is on a My Mind's Eye title card, I liked the color and shape but the wording didn't work so I covered it with additional cardstock and place the title there with American Craft Thickers and Simple Stories letter stickers. All the edges were inked. The butterfly stamp is from Jillibean Soup and I added a frosted heart from my stash with some embroidery floss. It's going to be a big month. 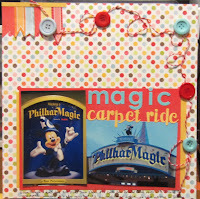 In no particular order we have National Scrapbooking Day, Memorial Day (the unofficial start of summer) and vacation! 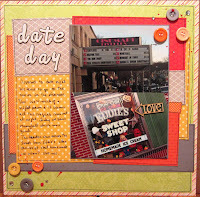 I don't have special plans for National Scrapbooking Day. 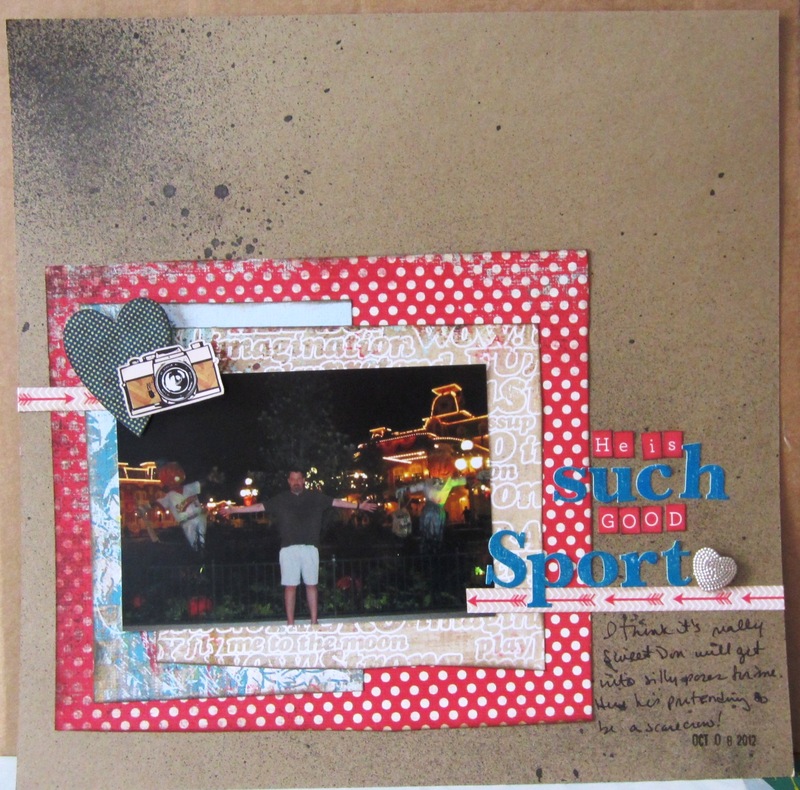 Big Picture Scrapbooking is hosting a Creative Crop with 10 hours of challenges, chats and prizes. It's free to join! My friends and I were talking about doing a virtual crop. We'll see. I also have a dentist appointment that day. For vacation, we are going to Palm Harbor, FL to visit my mother for mother's day. Most of my extended family is in the area, so I get to see them too. Then we are headed to Disney for a few days. It's been a long year so far and I am ready to get away for a stretch and not just a day or two. 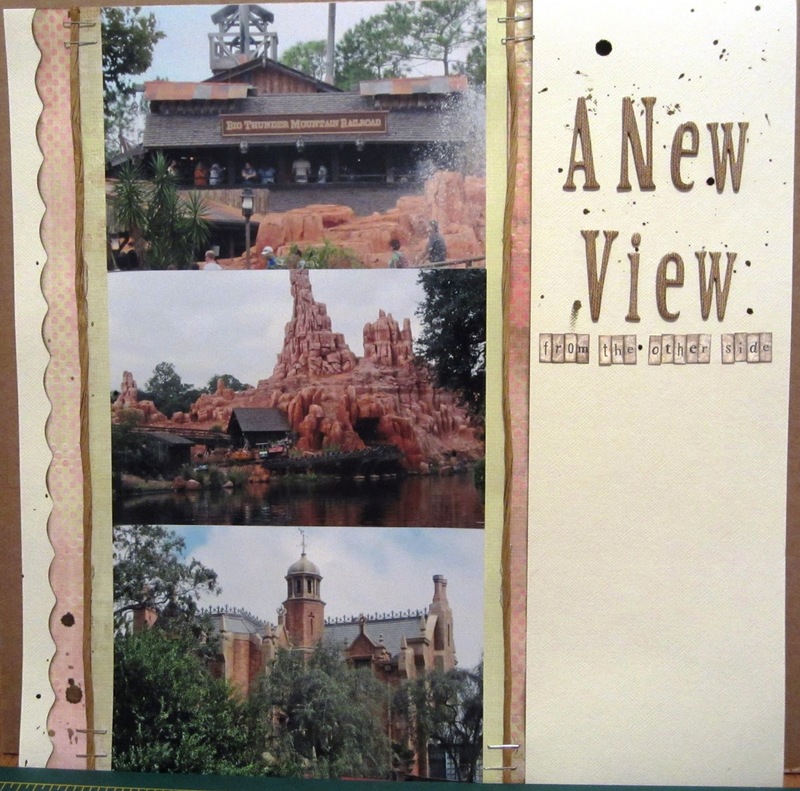 We are returning to the Boardwalk and reserved a Boardwalk view this time. There might be some noise from the hustle and bustle of the Boardwalk activity but it can't be worse than pool games. That's just brutal. Anyways, we'll be gone for about a week and I can. not. wait. Soon after that, Memorial Day is here. Three day weekend...yay! Let the summer begin! 1. Complete the Use it or Lose it Challenge - I have 4 pages to go. You'll see them on future posts. 2. Blog regularly - I slacked off a bit but I am ok with 12 posts for April. 3. Move completed layouts to d-ring albums - I took them out of the post bound albums but I considering alternative storage methods. I got a late start on the 50 Projects or Bust challenge since I placed some orders last month. My official start date is April 18, 2013. No more purchases until I complete 50 Projects. I have five done so far. 4. 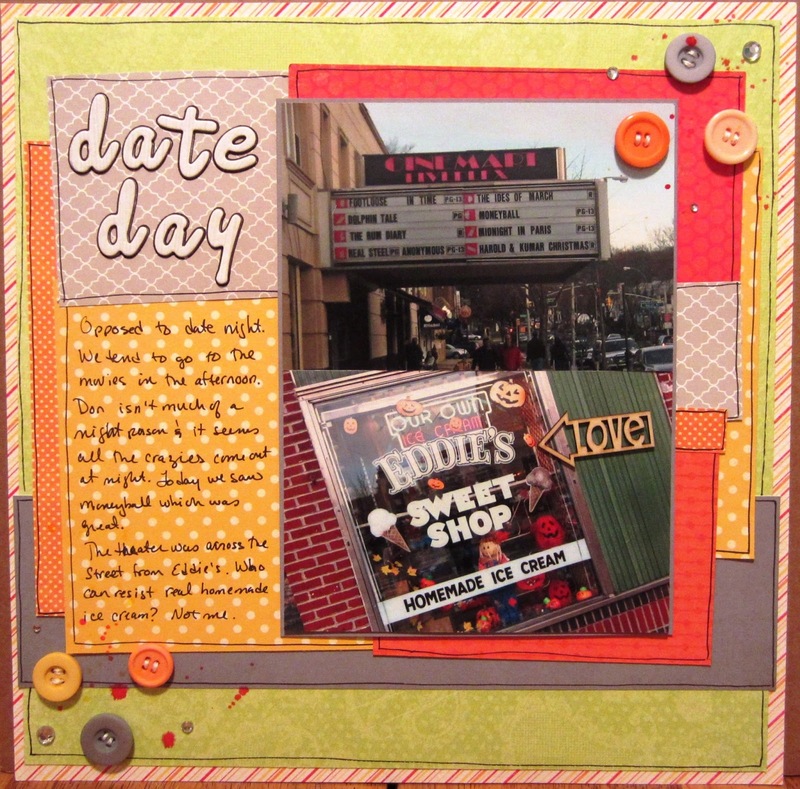 Participate in the National Scrapbooking day festivities on A Cherry on Top. 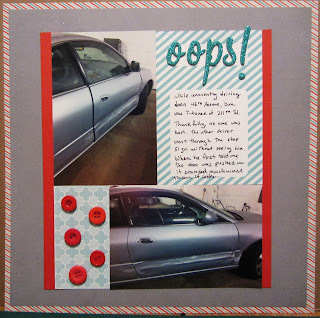 Do you have any scrap goals for this month?